Chinese 3D and IMAX action adventure fantasy film Mojin: The Lost Legend <鬼吹灯之寻龙诀> will be arriving in theaters across Mainland China on December 18, 2015. This week, the movie unveiled the music video for its theme song “Xun Long Jue” <寻龙诀>, performed by the movie’s lead actor Chen Kun (陈坤). “Xun Long Jue” is produced by female singer-songwriter Yan Yidan (严艺丹), also known as “Ivyan”, who first received attention for writing the soundtrack of Chinese period drama Scarlet Heart <步步惊心> in 2011. “Xun Long Jue” is an epic orchestral pop song. The lyrics refer to the movie’s main title, designing its lyrics around the words “Xun” (meaning “to find”), “Long” (meaning “dragon”), and “Jue” (meaning “formula”). 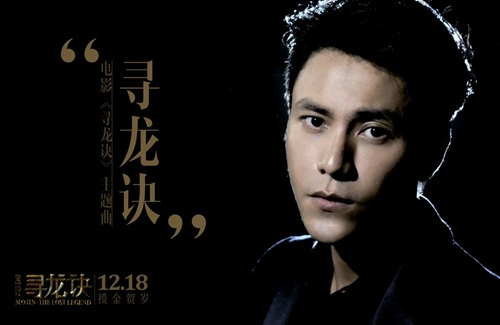 In the music video, Chen Kun performs in front of a grand orchestra, intercepted with scenes from the original movie. The film, directed by Wuershan (乌尔善) and produced by Chen Kuo-fu (陈国富), is an adaptation of the best-selling novel series Ghost Blows Out the Light <鬼吹灯>, a fantasy adventure about grave robbers seeking a hidden treasure. The first part of the novel was adapted into another film Chronicles of the Ghostly Tribe <九层妖塔>, which was released on September 30, 2015. The film also stars Angelababy as Ding Sitian and Xia Yu (夏雨) as Big Gold Tooth, playing prominent supporting characters alongside the trio. In addition to the main theme, Mojin: The Lost Legend has also hired a team of singer-songwriters to perform the movie’s character themes. Tan Weiwei (谭维维) performs Shirley’s theme song “Hell Is Paradise” <地狱就是天堂 >, Hao Yun (郝云) performs Big Gold Tooth’s theme “Journey West” <西行漫记>, Laure Shang (尚雯婕) performs Ding Sitian’s theme “Six Seconds’ Memory” <蝴蝶记忆太短>, and Liang Bo (梁博) performs Wang Kaixuan’s theme “Vulnerable” <不堪一击>. Check out the MV for “Xun Long Jue” here.